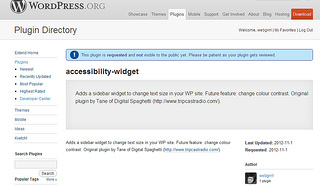 I’m finally making the Accessibility Widget an official plugin by registering it in the WordPress.org plugin repository, after much deliberation. The screenshot above was taken a couple of days ago, after receiving a note from WordPress.org (Ipstenu) that my plugin was being reviewed. And now that it’s up and I’ve made it live about two hours ago, there’s already 5 people downloading it. I’m panicking already, since it hasn’t been properly documented and I haven’t really made any part of the widget to be easily set up. It needs a proper CSS wrapper so that certain text sections of the site can be properly changed. Also, I feel quite guilty for putting the Accessibility Widget up, since I haven’t properly been maintaining and updating the Top Commentators Widget. I can’t update TCW using the current codes I have in my trunk, because I’ve changed them (it’s currently 1.5 beta). 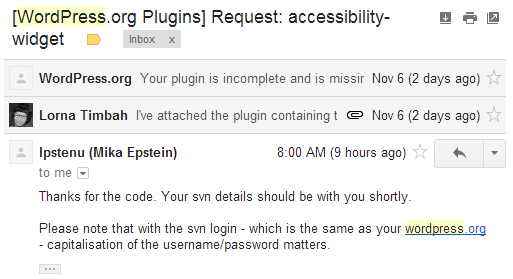 And also, I have a DESPERATE need for an accessibility plugin. I SERIOUSLY need to use it on my client’s web site, and this plugin fulfils the need. By the way, if you’re curious to see the Accessibility Widget in action, head over to this website’s sidebar right under the search form, and you’ll see it. Works on mobile devices, too. Thanks for the tip,There is also wp-chgfontsize which I have used on a couple of sites in the past but hasn’t been updated for a while now.